Join the ImagiKnit staff in a Nordiska KAL! Home > News > Join the ImagiKnit staff in a Nordiska KAL! Allison wearing the Nordiska that Diane made. Doesn't it look great on her? Sonja and Laura in their finished Nordiska's! Super cute! Sonja finished her Nordiska - yay! It's currently blocking and we can't wait to see it on her! Diane is currently working on the second sleeve. Modifications made so far: ripped back to the armholes, added a few more stitches and knit the rest of the body using US 5 needles. Knit 6.5 inches before doing colorwork. Sleeve 1 was done using US 4 needles and made longer. Did not knit Rows 41 through 43 of the chart. Laura is working on the sleeves. Picture is coming soon! Sonja, Laura and Diane have been working on the colorwork portion of the body. So addicting! Sonja, Laura and Diane have separated body and sleeves - yay! Sonja has already started the colorwork. Ashley started her Nordiska - looks great so far! It's a fun knit! The cable twists keep this fun and interesting. We're happy to see many of you are joining us! Please send us pics of your yarn choices and we'll get them posted! We've selected colors and are ready to cast on! Sonja is using yarn from her stash. Love that pop of yellow! Laura is using Mechita and Nuble. The burnt orange is gorgeous - this will be her main color. Diane is using Herriot Fine (one of her favs!). Ashley is using Mechita. She's shaking things up and will be using 2 colors. Love the color combo! 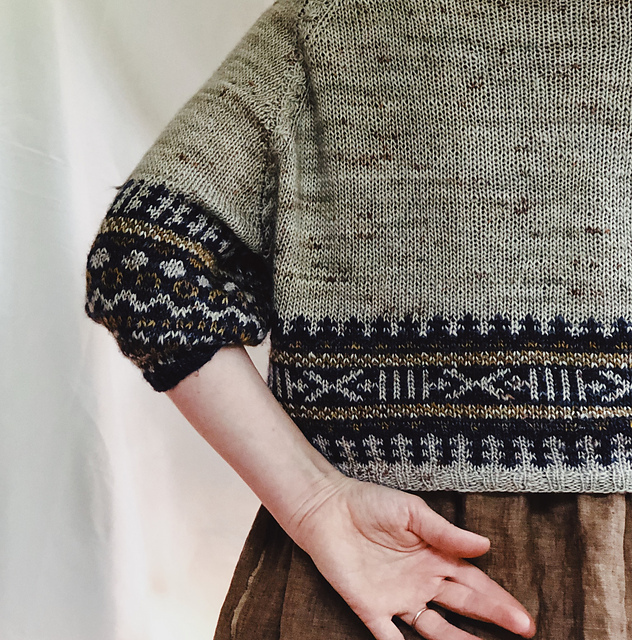 We're knitting Nordiska by Caitlin Hunter (scroll down to see progress pics). Join Sonja, Laura, Jenny, Ashley and Diane in this beautiful knit! We're having fun deciding on yarns/colors. Stay tuned as we share progress.